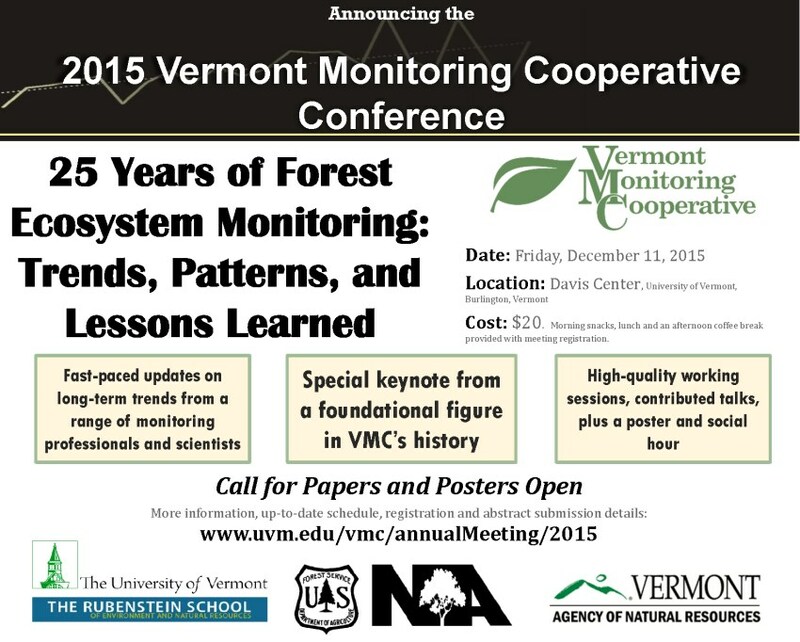 The Vermont Monitoring Cooperative (VMC) is pleased to announce that its annual meeting will be held on Friday, December 11, 2015 on the University of Vermont campus (announcement attached). 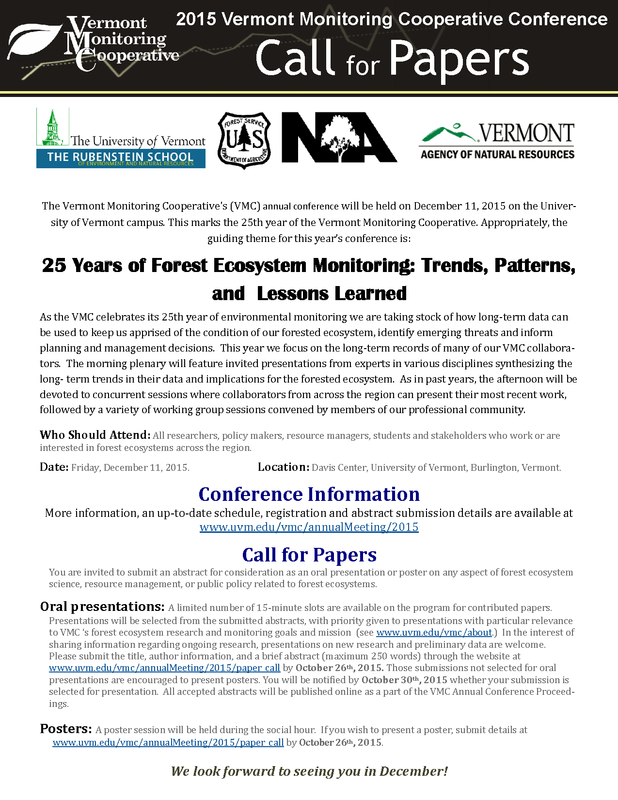 This year (2015) marks the 25th anniversary of the VMC and the conference theme appropriately is "25 Years of Forest Ecosystem Monitoring: Trends, Patterns, and Lessons Learned". The morning plenary will feature a keynote address by a foundational figure in VMC's history, followed by a series of fast-paced reports by invited speakers on many of the important long-term projects (forest health and productivity, birds, amphibians, mercury, hydrology and many more) supported by VMC over the past 25 years. The afternoon will again bring the return of concurrent sessions of short, contributed talks, followed by a diverse range of working group sessions organized by you, our cooperators. This year we will again end the day with a concurrent poster session and social hour. Please visit https://www.uvm.edu/femc/cooperative/conference/2015/agenda to view an up-to-date version of the agenda, which is still evolving. We would also ask you to please consider giving a 15-minute talk about your own research and/or monitoring efforts. Guidelines for submitting abstracts of your proposed presentation appear in the attached announcement. We will also be accepting posters for display during the poster session. Please see the aforementioned link for details about submitting posters. Registration for the meeting will open later in the month of October, at which time we will send out another notice. We will hope to see you at the meeting in December!